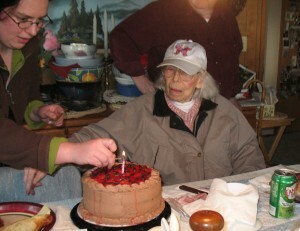 My Husband’s Grandma on her 90th Birthday. She was the sweetest person but Alzheimer’s took its toll. My Grandma has Alzheimer’s. It is hard to know what to get, because she has trouble knowing what to do with the gifts that she receives. Sometimes the presents sit around unused for months. Favorite food gifts mostly go uneaten, and other presents often end up unused or go missing (hidden for safe keeping someplace…. but no one knows where). Alzheimer’s is a terrible illness and we want to do all we can to make the holiday season a happy time. We want to give gifts that have meaning and purpose, but not gifts that just cause more clutter. Here are a few of my suggestions for Christmas presents for a loved one with Alzheimer’s. Each Alzheimer’s Patient is Unique! Remember to think about whether each of these gifts would be right for your loved one. These are what I would buy…. Not necessarily what you should buy. There are many stages of Alzheimer’s and it effects both men and women from many different backgrounds. Perhaps the most important gift you can give is your time, your smile, and your love. If you can’t be there, or if you are the caregiver and need time-off – consider putting your Christmas money toward paying for help. You can hire a nurse or aid who can help with the day to day tasks. It is a big help to just have someone else who can tidy up the house, or help your loved one care for themselves. Meals that don’t require any preparation are usually welcomed. Think deli food, delivery, frozen meals, homemade meals that just need reheating… With that said, here are some unique gift ideas that maybe they will appreciate. As the title says, this clock has the full names of the day and month, which is great for people with Alzheimer’s or dementia, who might not understand what a strange abbreviation like “Nov” or “Mon” means. This clock is also fairly large, with the time numbers being 1.5 inches tall, making it easier for people with eyesight problems to see. The rave reviews caught my attention… If your loved one would benefit from always knowing the correct time, this is a great solution. Toy Cat that Responds to their Touch – This cat purrs, meows, and moves. This cat was designed for kids, but some of the reviews are by adults who bought this for people with Alzheimer’s, dementia, or for those in nursing homes. This cat is designed to be very responsive. It can sense your touch in three areas – the cat’s head, back, and stomach – and it will move its head, its paw, open and close its eyes, and meow and purr. It also have motion and sound detectors, so it can tell if someone is nearby. This toy can provide a lot of comfort to someone who’s unable to care for a real cat. Buy a Talking Photo Album – This photo book allows you to record a personalized message for each picture. They can listen to your voice tell about the pictures! You can use this photo album to record a short message or story for each photo. You can say the person’s name, when the picture was taken, or say something funny or memorable. It’s hard to look at pictures if you can’t remember who the people are, and with the memory difficulties that people with Alzheimer’s have, this would make a great gift. Another great thing about a talking photo album is that it is comforting to hear a loved one’s voice. These are available in Blue, Navy Blue, Black, Beige, Gray, and Pink! These socks have treads on the bottom of them to prevent slipping or sliding. They combine the best part of slippers with the best part of socks! If you want to buy a gift that’s practical but will also be enjoyed, this is my recommendation. Amazon also has ones with stripes and other patterns. I know that with my Grandma, she enjoys things that are soft and colorful. I’d buy her the pink ones! Telephone with Pictures – Great Gift Idea for Alzheimer’s – Dialing a number is easy on this phone – just press the button! You can put pictures of people on this phone, so that all you have to do is push the button associated with the picture to call them. Even if they can use a regular phone now, in an emergency or in a later stage of Alzheimer’s, this phone might become very useful. I know that when something is wrong, it’s hard for *me* to remember numbers to dial. Imagine how hard it would be for someone with Alzheimer’s. Great phone to have for every day use, or for an emergency. Knowing that they can easily reach loved ones with a touch of the button is reassuring. Give the gift of Music – As you may know, earliest memories are often the strongest! Send them some of their favorite music. These CD collections are a great starting point! This blanket is soft and cozy. Again, my gift idea has to do with things that are soft to the touch. I think the sense of touch is sometimes heightened in this illness. Medical ID Bracelet – Write name, phone number, and medical information on it! This one doesn’t require engraving, so you can update it any time! This is something to fiddle with, and a way to keep their hands warm! Having something to fidget with turns out to be a calming thing for people with dementia. Plus, this is cute, soft, and warm! Here’s the product description: Each Twiddle has three attachments on the outside, and a squeezable ball on the inside. In addition to tactile and mental stimulation, all offer exercise for the hands as well as relief from arthritis. Read this article and the comments for helpful information for selecting the best gift. Previous Gifts for French Teachers – My Favorite Ideas! Next Gifts for Investors – My Favorite Ideas!